It’s here! The GiveBIG season is upon us. And, yes, the Church Council of Greater Seattle is participating. Friends of the Church Council are sweetening the deal with matching and stretching donations of their own! Anonymous friends will personally match gifts up to a total of $6,000. Another friend supports small gifts that grow over time: for those who gave $50 or less last year, contribute more than $50 during GiveBIG and the Spring Appeal and she will add an extra $5. 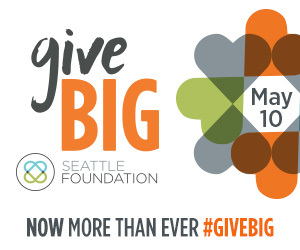 Make your gift online during GiveBIG on Wednesday, May 10 (or pre-schedule to be given that day) and the Seattle Foundation may select your gift for a “Golden Ticket” – an additional $1,000 stretch. It’s an online festival of generosity! On May 1, the Sanctuary Movement re-launched in a sacred gathering. People of many faiths and allies came together at Saint Mark’s Cathedral on Capitol Hill to listen, sing, and dedicate ourselves. The Church Council has been providing support to congregations and people of faith as they discern their roles and responses to “welcoming the immigrant”. New circles of diverse congregations are forming in South King County, churches organizing around their local needs – housing, immigration, or local business districts serving diverse communities. Our new Community Organizer, Joey Ager, and Board member Rev. Dr. Linda M. Smith, are present and nurture these new circles. Forging affordable housing situations from Bellevue to Seattle, Renton to Woodinville, we’ve pulled together and worked in coalition with faith communities, service providers, and other partners to gain significant wins in each of these cities across King County. Thank you for supporting the work of the Church Council and the other nonprofits throughout King County participating in GiveBIG. Because of you, our communities can doBIG Now More Than Ever.